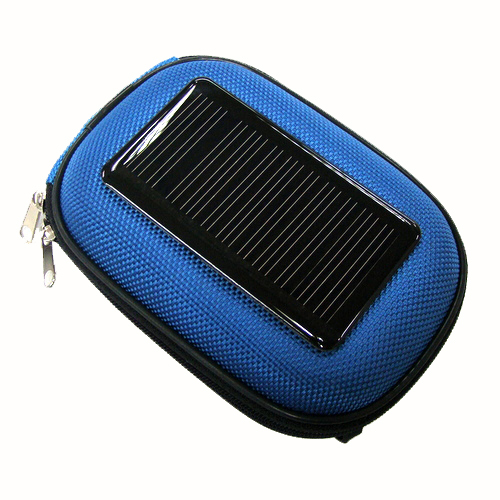 This Solar Powered Case is designed to charge many electrical devices from solar power. 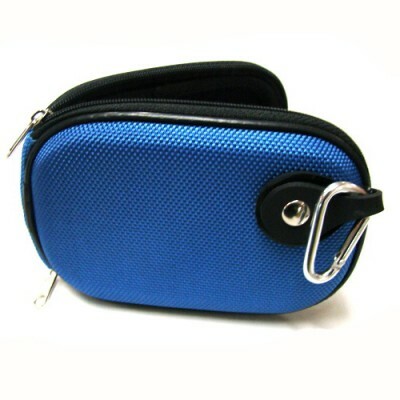 It can charge most small portable electronics, for example mobile phones, compact digital cameras, and MP3/4 players. The Solar Powered Case is large enough to hold most mobile electronics within it, to help protect them and charge them at once, and allowing it to be easily taken anywhere. The small blue bag measures 13.6 cm x 9.3 cm x 3.5 cm (5.4 in x 3.7 in x 1.4 in) externally and has an internal holding space of 11 cm x 6.8 cm x 3.2 cm (4.3 in x 2.7 in x 1.3 in). The solar panel connects to a 2500mAh lithium battery within which it stores the electrical energy. The device though can be connected to mains power to charge the battery as well in times when the sunlight is not strong enough. Full charge should provide about 100 minutes of talk time on a phone. The case comes with an USB cable, a connector to connect it to mains power, and 10 different adapters for mobile phones. The case does provide a safe environment for different electronics due to its padding while also being a store of back up power. When out camping this protection can be needed, as is the extended battery time for devices such as cameras and mobile phones. By having a solar panel this charge can then be renewed easily whenever there is decent daylight. The solar case is costs just $32.99 plus shipping fees. What is the name of the company that makes this product? Follow the link to get to the manufacturer. They are called China Grabber.